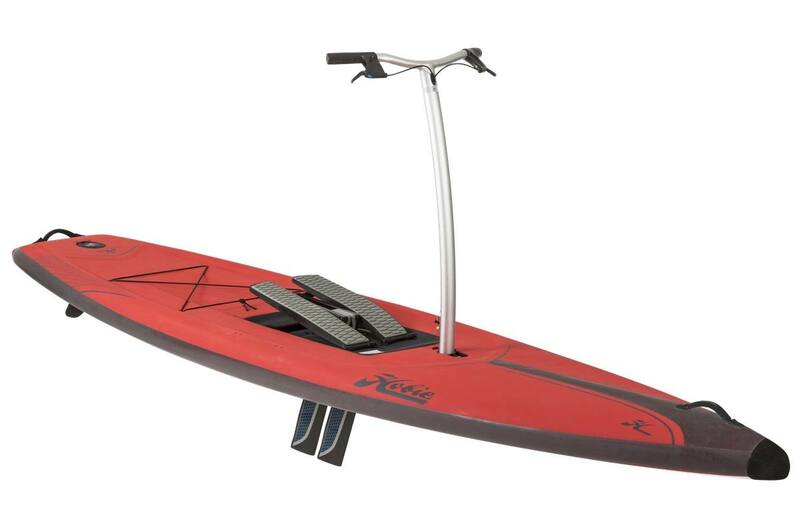 Hobie's revolutionary Mirage Eclipse standup pedalboard is now available to retailers and outfitters. Designed for the rigors of commercial use, it is ideal for resort and rental fleets. Incredibly stable, your customers can fly on the water using MirageDrive® leg power to pedal and steering controls at their fingertips. A natural stepping motion cycles the large topside pedals. The powerful underwater fins efficiently propel the Eclipse forward. Step out at an easy glide, effortlessly power into a headwind or pick it up for an all-out sprint. There's minimal setup. Go from the dock or a boat to the water in minutes. Ideal for cruising solo, with a partner or group excursions. The large EVA deckpad provides carefree, high-traction footing and comfortable cushioning for all-day endurance and increased durability. The fixed aluminum alloy handlebar enhances balance and stability. The ride is reassuringly solid. The board is lightweight and durable with features such as gear tie-downs, a carefree kick-up rudder, bow handles and option for side carry handles. The Eclipse takes standup to a whole new level.